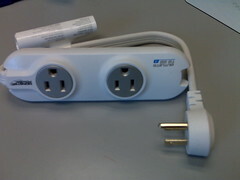 I brought this small travel power strip to IA Summit 2008 (write-up pending, but it was great). I’d like to say it was my idea, but it wasn’t; I snarfed the concept from Cindi Trainor. It’s small, powerful, sturdy, folds up neatly, and is insanely useful. If you travel with a laptop, you know the scene: you are in a coffeeshop, airport waiting room, or conference room. There are two plugs on the wall to be shared among many people. You can either arrive early, hog one of two outlets, and pretend people aren’t staring at you with sad puppy-eyes, or you can plug in your strip and invite others to share. Or you don’t arrive early, and someone is avoiding eye contact because he or she is using the outlet and feels bad about it. (At IA Summit, one of the plugs on each side of the room had the wifi router — made for great wifi, but also reduced available outlets by half.) Maybe someone promised their boss they’d cover this session in-depth, and their battery is low, so they really, really need the plug… but they know they’re using it at the expense of others. So you whip out your new social hardware and say, “May I share your outlet? I have this powerstrip!” Relief pours over your new friend’s face, because these people doesn’t want to be hogs — they’re just looking out for their own interests in a situation that makes it hard to share. It’s not just that you are able to share a power outlet with a stranger for a few minutes, but you’ve enriched a touchy social situation and made the world a little closer. This was written by K.G. Schneider. Posted on Saturday, May 3, 2008, at 9:21 am. Filed under Uncategorized. Bookmark the permalink. Follow comments here with the RSS feed. Both comments and trackbacks are currently closed. I just bought one of these two weeks ago and used it at a conference this week – so useful! And, as you said, very social. Okay, I have never ordered anything so quickly in my life. I got halfway through your post and hopped onto Amazon. What a brilliant idea… at last, I can write at the Blue Moose without guilt. Or I could, if I would learn to just say no to muffins. Awesome. I so need one of these for traveling. A lack of power outlets always seems to be something I encounter, but I don’t want to add another bulky item to my bag, this is hopefully perfect. I’ll admit that the social hardware power doo-hickey I carry around just looks after myself. It is a Ziotek Power Strip Liberator Plus ($2.59 each at X-Tremegeek.com). It only allows for one addition outlet, and it is also handy when dealing with large “brick” power supplies. I made friends fast at Code4Lib 2007 when I schlepped over to the university bookstore and brought back a powerstrip (regular old 6-plug variety) to a room where 75 people were all installing software on laptops, in a room with literally four electrical outlets. At least people on their last gasp of battery life could plug in. What’s amazing to me is that public places like new-ish conference rooms and airport terminals are still being built with such stingy outlet placement. Right, Thomas… and that otherwise echt-tech conferences miss the ‘lectricity part of connectivity! Although I haven’t gotten around on to it, but I’ve been thinking of getting a power squid for this reason. Meant to get one to take to this year’s code4lib, but didnt’ get around to it. “social hardware”! What a great concept. And this is a terrific ‘gotta have’. Ordering it now and adding it to my list of gadgets not to forget when traveling. You know, that list you printout and forget to actually read and check off everything and then you get there and slap your head…. yeah, that list! KGS – Good point ;). I seem to remember there was a similar one that was travel-friendly, but can’t seem to find it now. Maybe that’s why I never got it. But now I notice “rotating electrical sockets” also at thinkgeek. Might be time for a little home improvement project. Ah, thinkgeek. One of these days I’ll actually get something for myself from that site. I bought one, not when I read this post – although I meant to – but when I saw the link in AL Direct. Cool. Viral shopping goodness. Also, it’s cute. I find technology entirely irresistible if it is useful and cute. I just bought one of these. I like it already! The one caution I have is that the cord works as advertised — it will trip if overloaded or on a bad circuit. That’s what you want, but you may want to test your strip before sticking it in your bag (or just reset it before you take off for a trip) so you don’t do as I did and grandly offer the use of your strip only to have it not work… it resets immediately (a good thing). I too purchased one of these pieces of “social hardware” after you mentioned it here. The first time I shared it, there was a brief power dip in the building. Lights went out and back on–and the next thing we knew, all three of our laptops were showing low batteries before we realized we’d forgotten to hit the reset button! Thought you’d appreciate the musings about the desirability of a separation of cafes by type of visitor. I bought one based on your recommendation, and was so delighted not to have to unplug my bedside lamp in the hotel just so I could have both cellphone and laptop charging nearby.